The first musher is in White Mountain, Dallas Seavey. About 4 hours later, his dad, Mitch Seavey arrived with a 30-minute lead on Aaron Burmeister. In White Mountain mushers must take their last 8-hour mandatory stop. After that, it’s on to the finish. I am hearing people say we are looking at about a 4:00 a.m. Alaska time finish. A couple of weeks ago I was writing about Anchorage and Fairbanks preparing for the start of the race, now Nome is preparing for the finish. Front street is turning into Iditarod central. Sunday, crew worked to erect the famous Burled Arch. Monday they added the finish banner and the finish chute. After I arrived today I walked up and down Front street to check out what was going on. The podium the winner and his dogs pose for pictures on was being moved into the chute. Cameras are stationed for media as well as the live finish. 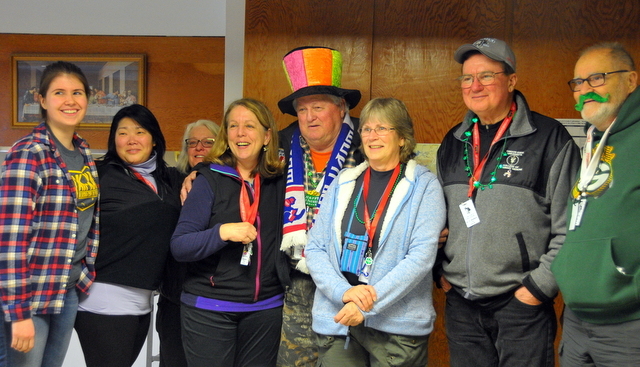 In Iditarod Headquarters, also known as the Mini, community members can sign up for several different volunteer positions. Students are selling food and drinks as a fundraiser. Signs are hung from the ceiling with each musher’s name. Comms and the vets are also positioned out of the Mini. The dog lot is housed in the parking lot outside the Mini. Right now the lot is waiting for finishers to occupy it, but currently the dropped dogs are residing in the lot. 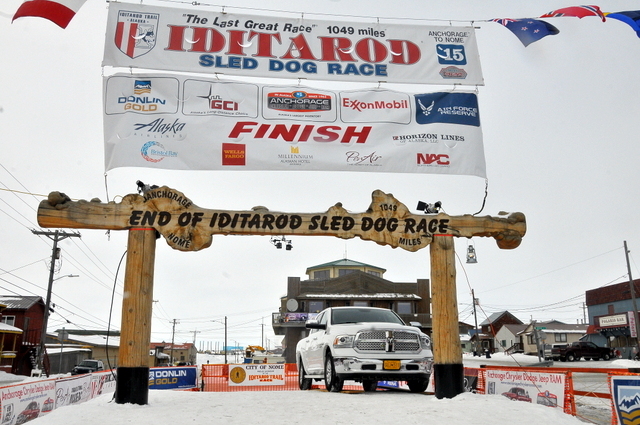 Nome is hosting many events during the week of the Iditarod. Among the events are; Craft fair, Bering Ice Sea Golf Classic, book signings, Dog Pull, Snow Cat tours, Sled Dog rides, many meals, and much more. Many sporting events are taking place as well; a basketball tournament, a 5K fun run, and a snowmachine race. Behind the Mini a crew was gearing up to head back to the Safety checkpoint. The Comms and vets crew have a 22-mile snowmachine ride to Safety. This crew will ready the checkpoint and wait for teams to check-in and most likely blow right on through. At the Community United Methodist Church of Nome, other volunteers are resting for their shift to work. Dinner was served Deb and Gracie cooked a wonderful meal of turkey, mashed potatoes and gravy, corn, and a delicious dessert of berry cobbler. After visiting and some games of Mexican Train Dominoes, most will rest up in the church sanctuary before heading out to the finish. As soon as a musher comes off the ice and onto the street, the siren will sound in Nome. This notifies residents that a musher is about 5-minutes from the finish line. As I write this, Dallas has left White Mountain and on his way to Safety, then Nome. Set your alarm so you can watch the finish of the Last Great Race online. You can enjoy the finish by being an Insider member and stream the entire finish all the way to the Red Lantern winner.